Little Bit Funky: 20 minute crafter-- Pez dispenser display! 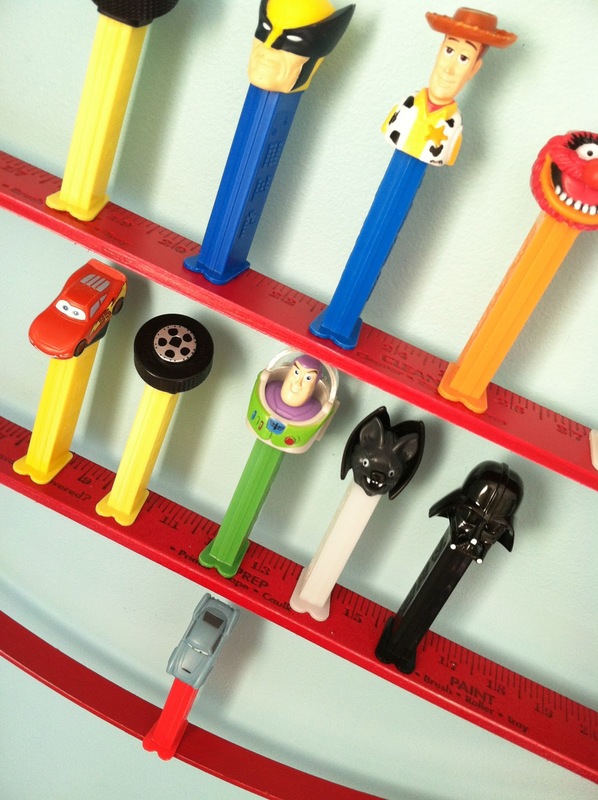 20 minute crafter-- Pez dispenser display! Last week I solved a simple, little, annoying problem. My boys (and I) like Pez dispensers. But like stuffed animals and gremlins, if you leave them alone in a room together, they WILL multiply. They were everywhere and there was no reigning them in. I spied this idea in Family Fun magazine and I knew I'd be making one...or two. 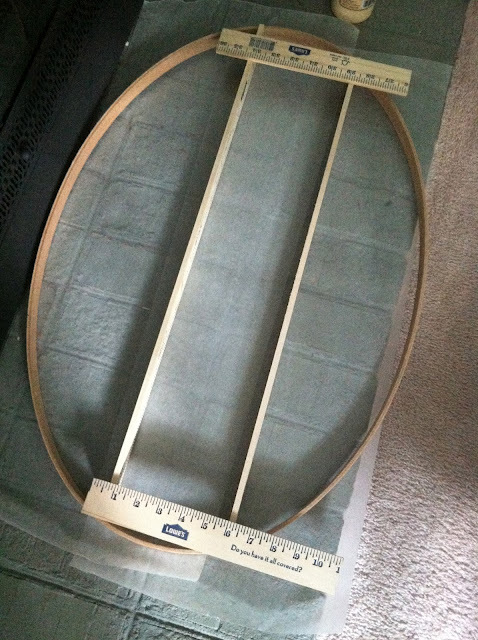 I got a HUGE oval quilting hoop from Joann for about $3.50 and two yard sticks from Lowe's for .64c each. I measured, cut and leveled out the yardsticks. 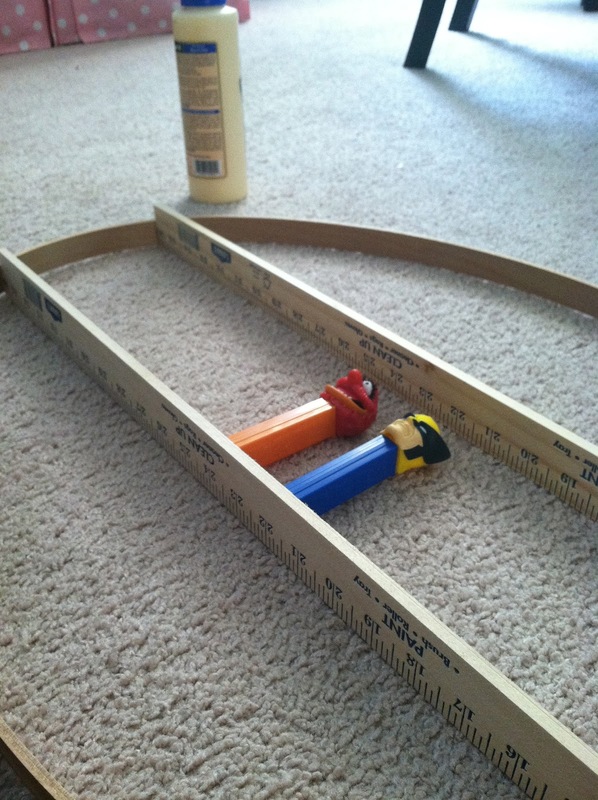 Then while I have it all laying level and flat, I tack it together with wood glue. 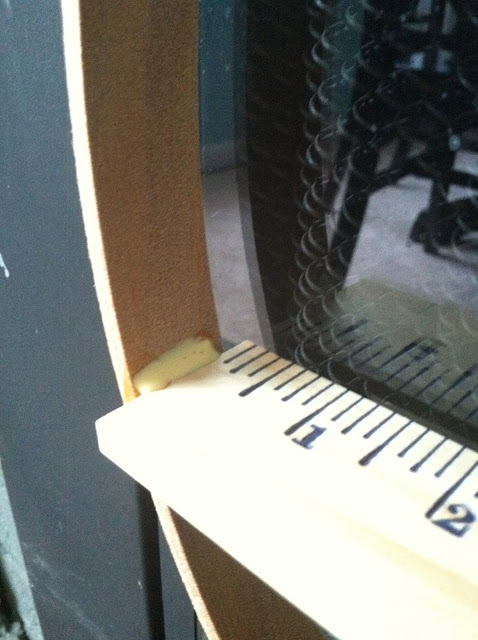 When that was dry, I reinforced it a bit more with more wood glue. 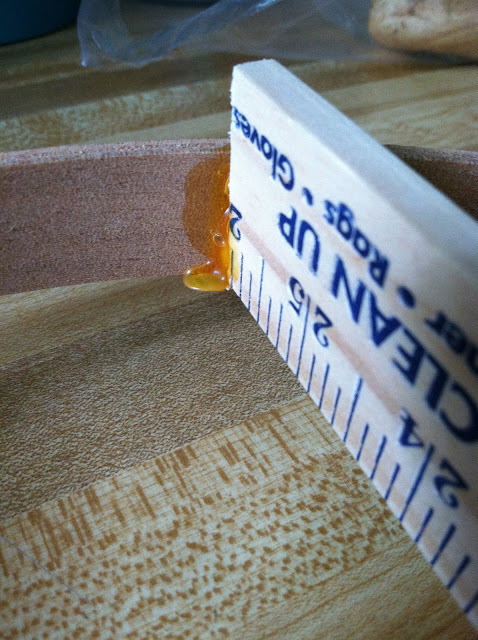 When it was totally dry, I used scissors to cut off the excess glue. Spray paint it, sand it and hang it! Once in our new house, I will hang it firmly in place. This is amazing! I wish I had seen this when we were hanging up my husband's Pez collection. Of course, it wouldn't have held all of them... He has over 400!! (Our basement looks like a toy factory threw up.) But I think this would work great in my daughter's room for her little toys. So cute & easy!! 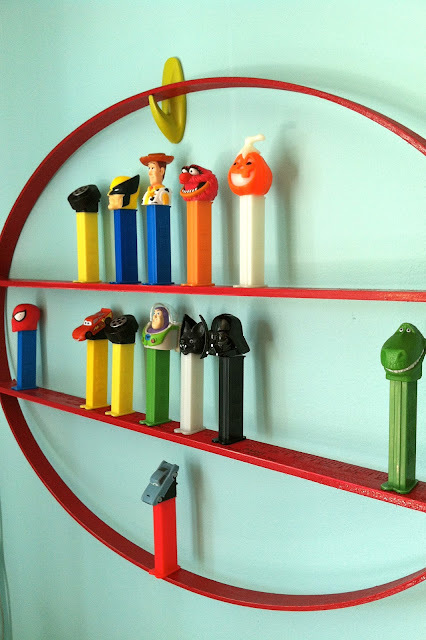 Makes me want to start collecting Pez's just so I can make one & have a cool decoration too. That is sweet!! Love it! That is sweet!!! I love it! Love this! It would work great in my son's room to display Lego Minifigures! Oh my gosh! That's brilliant!! I've been wondering what to do with this collection forever! I came close to getting rid of them more then once but I couldn't do it. There so old school-new school cool that I knew I wanted to keep them. Thanks for solving a very old problem, and cheap to boot!